By the time The Beatles made Magical Mystery Tour (1967) they had complete creative control over their art. When it came to make their next film, they took Richard Lester’s advice and decided to do it themselves. He had, of course, directed them in A Hard Day’s Night (1964) and Help! (1965) and knew what the band was capable of doing. They decided to recreate the mystery tours that occurred in their hometown of Liverpool. People would board a bus to an unknown destination. What a perfect concept for a band looking to experiment musically as well as visually. So, they wrote a rough outline and enlisted several actors, close friends and fellow musicians and off they went to the south west coast of England in a largely improvised film. The end result was aired on British television where it was criticized by the British press and public. What had been filmed in trippy colors was shown in black and white and so it is no wonder that the film was received so poorly. Magical Mystery Tour was meant to be seen in color. The film consists of a series of non-sensical vignettes, like the one where Paul and Ringo are berated by an army officer bellowing gibberish. In another oddly amusing scene, The Beatles participate in an impromptu marathon run, which continues in the bus racing against cars. A particularly memorable sequence takes us on a trippy journey through several majestic landscapes (originally shot for Stanley Kubrick’s 2001: A Space Odyssey) as seen through a variety of saturated color filters akin to a dreamy kind of acid trip. Magical Mystery Tour adopts an abstract, even stream of consciousness structure but each vignette has a story with each character having their own individual story as well. For a film directed by four people all of whom were novices, Magical Mystery Tour employs an impressive array of techniques, from split screens to sped-up action to point-of-view shots to freeze frames. There is also a surprising lack of dialogue. Compare this film with A Hard Day’s Night where The Beatles were given clever, snarky (disguised in cutesy comedy bits) and, at times, too-precious dialogue pared to constructed “storylines.” Magical Mystery Tour is unscripted and therefore ultimately more personalized as every line spoken is right from their own imaginations. For example, “Blue Jay Way” is a head trip courtesy of George Harrison that is so vivid one almost gets a contact high from it with the mind-expanding imagery on display. It’s like every song sequence represents the influence of a specific drug. 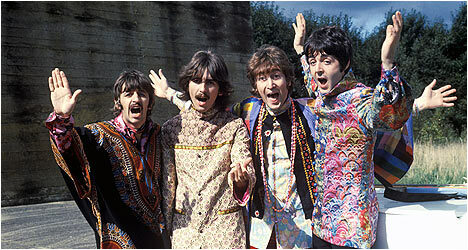 In retrospect, Magical Mystery Tour can be seen as the missing link between Help! and Yellow Submarine (1968), which saw The Beatles go from the most popular, mainstream band to a very experimental one. This film often feels like the band is making it up as they go along, learning how to make a movie by doing it – but in a good way, a way that feels as fresh and unconventional today as it did back then. Magical Mystery Tour is a potent reminder of just how great The Beatles were, especially with stone cold classics like “I Am The Walrus.” This film was a daring move for the band to make at the time. They were extremely popular and could have played it safe but instead they decided to do visually what they had been doing musically – push the envelope and have fun doing it. The picture quality is as close to flawless as one can get, especially with a film made in the late 1960s. The transfer on this Blu-Ray is remarkable! For a version that was supposedly cobbled together from existing prints as opposed to the original negative, which was destroyed long ago, it looks surprisingly good. While the dialogue sounds a little flat, the music portions have an impressive range and sound crisp and clear. There is an audio commentary by Paul McCartney. While not all that informative, his track is chock full of filming anecdotes that are certainly entertaining to hear. “The Making of Magical Mystery Tour” starts off with Ringo Starr claiming that the film was Paul McCartney’s idea. He came up with an outline written up within a circle diagram. The band didn’t plan out the trip – where they were going or for how long. There are new interviews with Paul, Ringo and some key cast and crew members along with archival footage of George and John. Everyone chimes in with their memories of making Magical Mystery Tour. “Ringo the Actor” features the musician talking about acting in the film and offers some reflections making it. “Meet the Supporting Cast” features some fantastic footage of actress Jessie Robins (she played Ringo’s aunt) who was also an excellent singer (we see her belt out a blues tune on the bus) and a talented jazz drummer. Several others are highlighted and we see what they did before appearing in this film. There is also a promotional video for “Hello Goodbye,” which didn’t appear in the film but was a song that appeared on the subsequent album.